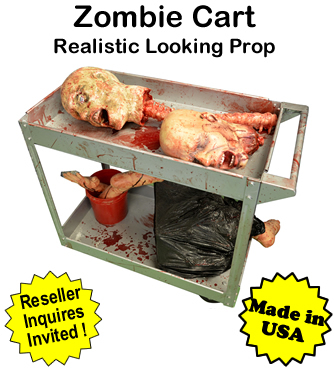 Zombie Cart Prop - Dino Rentos Studios, INC. 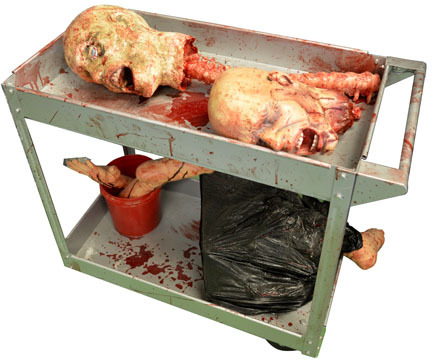 Shock and terrify with this realistic looking Zombie Cart Prop. Items included: real working cart with wheels (blood splattered), 2 bloody disembodied heads (1 with attached spinal column, 1 without), 1 hand &1 foot in bucket, and 1 garbage bagged body part pile prop (with protruding leg). Horrific-looking prop sure to illicit shrieks and gags alike. Perfect for any haunted attraction, theming or Halloween event! Head on top shel vibrates when you puch the button.